Hi sissy’s…. I hope u r liking this story. U can tell me if u don’t like or feeling bored.. let’s start now. Sanskar is moving to and fro. Karan is and observing him. Kar: Wats problem now? Everything has been arranged. San: ya I know. But feeling something, I don’t know wat. Kar: kya Karu haye, Kuch Kuch hota hai. Kar: laughing. Ok. (In ragini’s style) don’t wry baby. Everything will b fine. Sanskar hits on his stomach playfully. Karan clears his throat: it’s our. Not only u.
San glaring him: u r behaving too much nowadays. Don’t worry Naina will correct u. I’ll Tel her. Kar: arey. Marriage is yet to happen. Now only complaints? San: the way you are behaving, …. Kar: ok stop now. as per plan everything is ready. Let’s sleep now. Kar crossed his arms: I understood. Actually I also want to see my girl. It was midnight. Both slowly go to Ragini’s house. They climbed pipe and reached ragini’s room where both nairag r sleeping. Karan goes near Naina where as sanskar stood near window only hiding himself. Seeing Karan Naina was about to shout his name excitedly but Karan stopped holding her mouth. They share an eyelock. Due to little noise Ragini’s sleep broke. She came to know that Karan came to meet Naina. She was quite as she doesn’t want to disturb them. She saw them through mirror and smiled seeing them lost in eachother. She remembers sanskar. Rag in mind: I wanted u also come like this. But I know u’ll not. No prob, I’ll wait. I know we’ll also have moments like this. Sanskar also smiles seeing her smile hiding. San: I know u r thinking abt me now and u also wanted me to come to meet u. Sry Ragini for making sad abt this. But in future surely u’ll b happy with me. Ragini closed her eyes and sleeps in sanskar’s dream. Here sanskar signals Karan to come. Karan kissed Naina’s cheek and comes to sanskar. They both left. Rag: u wud have also kissed him na? U missed it rite? Naina without knowing that Ragini spoke she told : rite. She came to sense that Ragini woke up. She blushed. Rag: my cheeku is blushing. Karan is so cute and romantic. Nai in mind: sanskar is also cute Ragu. Don’t wry. Just wait til marriage. Marriage day. All were busy in preparation. Brides and grooms r in thier world. Jan: Ragini, Naina , swara. Get ready fast. Here Shekhar also tells grooms to get ready. Grooms r waiting for their partners in mantap. They were desperate to see them as Thier bride. Especially sanskar, as first time he’s feeling for Ragini. There was no bounds for his happiness. Brides comes and sits beside thier partners. Grooms were lost in them. Pandit ji coughs to make them come in sense. But sanskar was still seeing Ragini, where as Ragini was thinking abt when sanskar Wil accept her. This time laksh and Karan both coughs. Then sanskar came in sense and saw everyone seeing him only. He bend his head with blush. San in mind: first time m feeling that a gorgeous girl is sitting beside me, who loves me a lot. Till now I was blaming u and was not liking u. But now I love u. Till now ur life was colourless since u lost ur friends. But now I’ll make it colorful. It’s starts from now only, from ur colorful bridal dress. Pandit ji chants mantras and declared them as husband and wife. Remaining rituals over. Naina went with Karan to his home. Before going nairag hugged and got emotional. Nai: Ragini, now we r bounded by relationships. We r going start a new journey from now. I wish u all the best. And ha, try to control ur anger ok.
Rag: m gonna miss our days. Seeing them emotional Karan says. Kar: we r living in one city only. U both r behaving as if we r in different countries. All laugh. Nairan left. Then swalak and ragsan grahapravesh ritual done. Remaining rituals also over. Now it was ritual of finding ring. First swalak started. Swara found ring first. Now ragsan turn. Both kept their hand in bowl. San in mind: I want u to win. U r already ruling my heart. Rag in mind: this time ,for the first time, Ragini Sinha want to loose. I want my love to win. Time was going on. No one is ready to take the ring. Laksh in San ears: I know u want Bhabhi to win. And she wants u to win. U just take ring and handover her inside bowl only. No one knows. San smiled and did same. He took ring and keeps in ragini’s hand. Ragini suddenly get shocked at sanskar’s doing. She felt as current gone through her body when he touched her hand. She was looking him only. Laksh: these girls also. After having ring also she’s not taking off her hands from bowl. 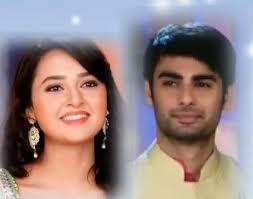 Laksh signs swara. She raises ragini’s hand. Everyone sees ring in ragini’s hand and claps. Suj: sanskar, I had told u ma, one day my DIL will come and Wil make u correct. Love u both. Ragini smiles. She sees sanskar staring him. She was blushing little. Ragini was sitting in middle of bed. First time she was feeling strange nervousness. She was waiting for him but also she was tensed abt how she’ll face him. She proposed him forcefully. She’s having confidence that he’ll love her, but when? This question making her tensed. Sanskar entered room. He also felt nervous. San in mind: how to tell her that I too love her. I planned everything very well but after coming infront of her m getting nervous. He came slowly near bed. Ragini got up from bed and stands Infront of him. She cups his face like he’s her kid. Rag: I know u may b feeling awkward. Don’t worry. M not forcing u. I really love u truly and want u too love me. But love happens. And I don’t know y m sure that it’ll happen with u. I’ll wait for weeks, months and yrs also. When u’ll accept me that day only first night for us. U sleep on bed. M sleeping on couch. Don’t think abt how Wil I sleep on couch. M habituated as in my college I…. Rag: GN baby. Love u. She closed her eyes. Sanskar was standing in that position only. San: Y din’t I say her abt my feelings? She stopped but I shud I told her that I too love her. M idiot that I stood quite listening her. Now shall I woke up her to say my feelings? But she is looking cute while sleeping also. He sat on bed. After sometime. San: tmrw whatever happens I’ll tell her. Mrng arti time Ragini comes down in saree. She was looking beautiful in traditional look. She goes to home temple and took arti. Sujata blessed her. Utt: mom, wat u r asking? U shud ask Bhabhi that y she woke up this early. Bhabhi u shud learn from laksh Bhai and swara Bhabhi. Suj: uttara. Stop teasing her. Rag: he’s still sleeping mom. Shall I wake up him? Suj: let him sleep. Till that ur first Rasoi Wil do. Wat Wil u prepare? Rag: mom I don’t know much abt cooking. But I can prepare kheer. Suj: ok u prepare for that. Suj: hmmm. My both bahus took responsibility of home. M happy now. M free. Trio smiled. Sanlak comes for bf. Sanskar saw Ragini in saree. He cudnt take off his eyes from her. Lak: Bhabhi looking cute na? San looking at her smilingly: yes. San: I mean both r looking gud. Lak: but Bhabhi is different. Hai na? Both smiled looking eachother. Swarag served both sanlak. Ragini got little tense thinking whether Wil like it or not. Sanskar tasted and ate fully bowl at a time. San: oh. I thought u. Well it’s gud. She got happy listening him. Suj: my bahus r not less in anything. Swarag smiles looking at each other. Suj: sanskar. Ur dad called me yesterday nite. He told he got leav for few days so he’s coming. U go to airport to receive him. It’s almost time. San: ok mom. I’ll leave. Suj: I think sanskar came with his dad. Ragini u r elder DIL. U go and welcome him with arti. After long time he’s coming. He gets leave rarely. Ragini took arti plate and opens door. She dropped plate in shock. The post You are only mine- ragsan- part 24 appeared first on Telly Updates.